Background: Speech is the primary goal of palatoplasty, however, there is no current data available about the long term speech evaluation after palatoplasty in our hospital which is the national referral hospital that has the only cleft craniofacial center in Indonesia. The initial data of speech outcome is required for further research which assessment should be standardized and applicable to Indonesian children that mostly speak bahasa. This study aims to get initial data by evaluating speech outcome of patients that underwent palatoplasty with adapted perceptual assessment words in Indonesian language, and describe factors influencing speech. 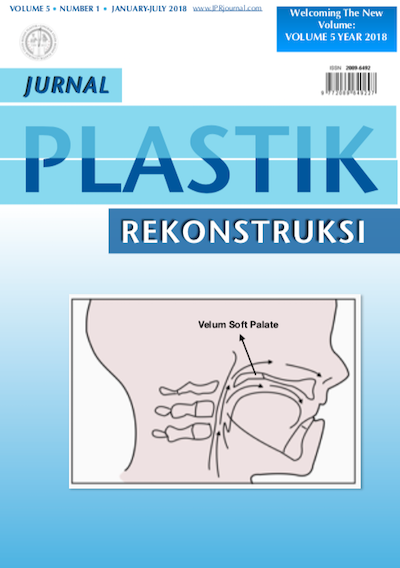 Method: This research is a cross-sectional study to evaluate speech outcome of patients underwent palatoplasty in Cipto Mangunkusumo Hospital from October 2010–December 2012 conducted from December 2017 – July 2018. Result: Total 23 samples were measured for articulation rating where 17 (74%) patients had normal production of majority of phonemes, while there were 6 (26%) patients had predominantly distortion of phonemes. The hypernasality rating were normal in 12 (52%) patients, mild in 5 (22%) patients and moderate in 6 (26%) patients. The speech intelligibility rating were dominantly normal which all speech is understood in 17 (74%) patients and the rest of 6 (26%) patients were listeners attention needed. The velopharyngeal competence were good in 16 (70%) patients, fair in 1 (4%) patients and poor in 6 (26%) patients. Conclusion: Management of cleft palate patients will be achieved by well integrated services including speech pathologist and orthodontist. By giving the long term follow up to the patients, the optimal outcomes will be achieved. This research can be used as a reference for speech outcome evaluation in cleft palate patients in Indonesia.